In September 1773 during Cook’s second voyage Captain Furneaux of the Adventure took aboard a young man of the island of Huahine near Tahiti. Omai became the first South Sea islander seen in Britain. In his early twenties, Omai became the darling of the London scene. He was introduced to the King and Queen, wined and dined in high society circles, and painted by the great artists of the time before being returned to his native home in 1776. Omai was painted by some of the great artists of the time, including Joshua Reynolds, whose portrait shows him in the ‘habit of his country’. Engravings were produced from these paintings. They capture Omai’s grace, ‘natural’ good manners, genteel behaviour and deportment and, of course, exotic appearance. For a short time he became a popular living curiosity in society circles. 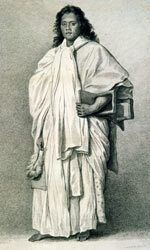 A play based on his life, “Omai; or a Trip Around the World”, was performed at the Theatre Royal, Covent Garden, in 1785. The King gave him an allowance of money and lodgings in London. Immediately news of this exotic visitor spread. He became accepted in high society circles and was welcomed in the homes of the nobility and gentry all over the country. News of his entry into society was followed by the arrival of Omai himself, accompanied by Joseph Banks, in the North Country of England. Commodore Phipps of Mulgrave Castle, Yorkshire, was their host. Omai bathed in the sea, prepared luncheon in an umu or Polynesian earth oven and shot game birds on the moors. Whilst in the North East Omai was taken to visit Kirkleatham, near Redcar, home of the Turner family. Charles Turner (1726-83) was one of the great reforming landowners of the time and continued the development of the family’s estate. 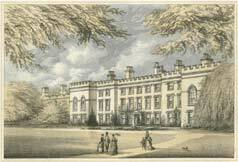 In the mid-1760s he enlarged and gothicised Kirkleatham Hall with castellations. Omai was entertained here in 1775. The Hall was demolished in 1956. After a short period society lost interest in Omai and it was decided that he should return home with Cook on his third great voyage when the ships sailed in 1776. 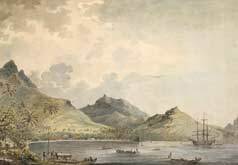 In 1777 Omai returned home to Huahine with his gifts of: port wine; gunpowder, muskets and bullets;, a hand organ, some tin soldiers; a globe of the world; crockery and kitchenware; a variety of fancy goods; animals, including a horse; and a suit of armour. This is a fanciful impression of Omai’s return home. Omai was settled back on Huaheine in a house and garden built for him by Cook’s men in the Harbour of Huaheine. The final parting when the ships sailed on 2nd November 1777 was ‘a very Afecting Scean’.